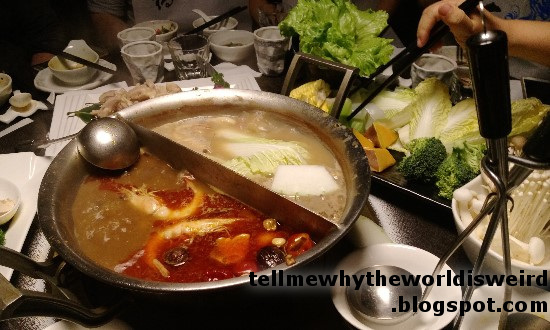 In China we have a type of meal called 火锅 [huǒ guō], or hot pot. It means you have a pot of boiling soup on your table, and you- the people eating- put food in, wait for it to get cooked enough, and then pull it out and eat it. 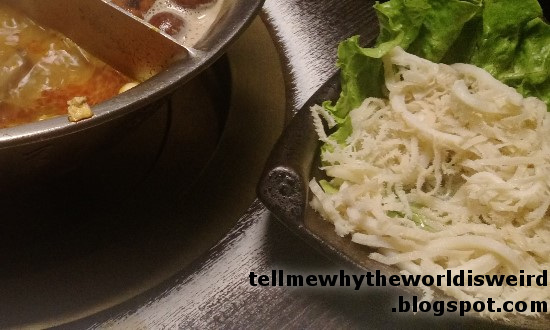 It totally blew my mind the first time I had it, because you go to a restaurant but you, the customer, are the one who's responsible for cooking the food. 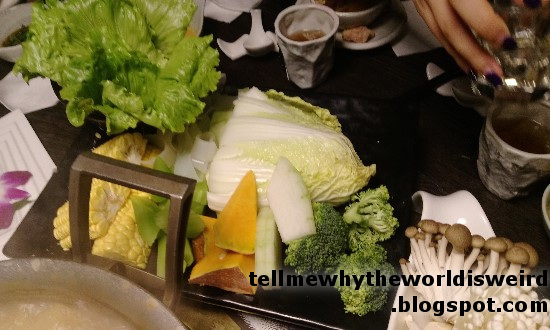 Like, they bring it out all cut up already and it's pretty simple to put it in, but still, wow, you go to a restaurant and pay money for raw food. And for the experience of boiling it in the pot. 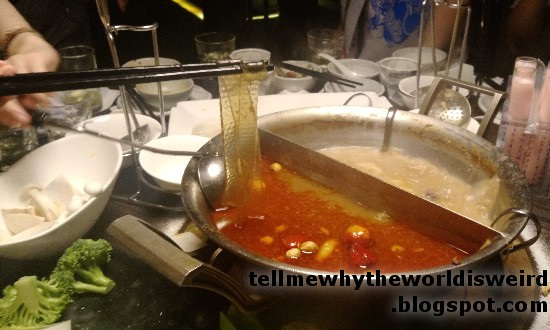 At this particular meal, we ordered a pot that has a divider so you can have two different kinds of soup- one is spicy and one is not. 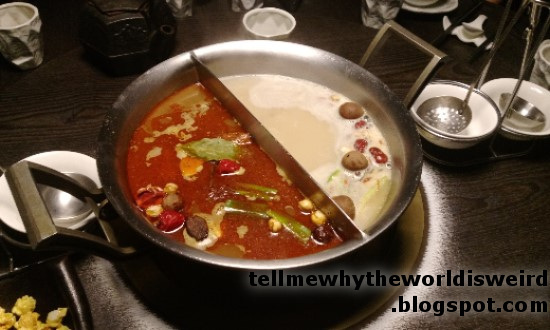 Also, the one in the photo is a pot shared by the whole table, but at some hot pot restaurants each person actually orders their own pot individually. 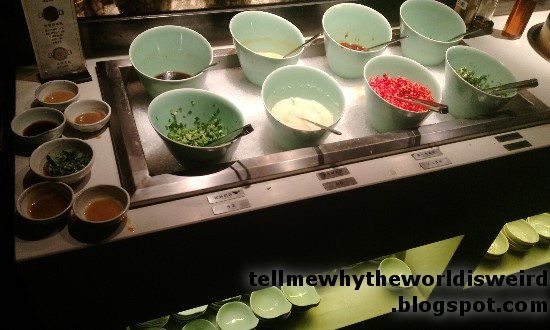 You get up from your table and go over to the sauce station, get a little bowl, and put in whatever mixture of different sauces and other seasonings you want. Each person can make their own unique mixture in their own little bowl. This is for dipping food in after it gets boiled. This is lamb or beef, I don't remember which. Notice that the meat is cut really thin. This way it only needs to boil for about 10 seconds, then it's ready to eat. The white strips are cow stomach. 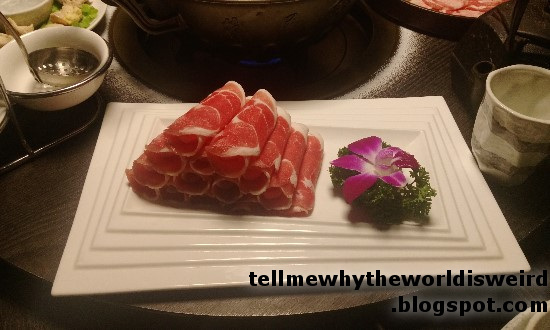 I don't like cow stomach because it's chewy, not like regular meat. Hendrix eats it though. I think this is pork? Or maybe chicken. 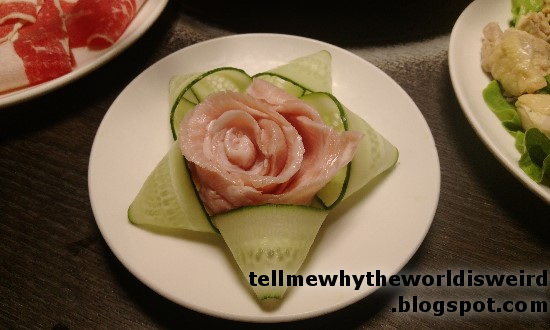 Arranged all fancy with cucumber slices. 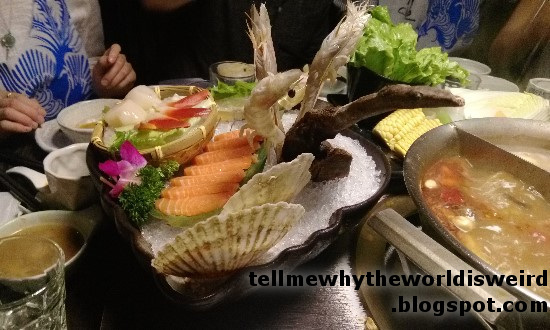 Bowl with different kinds of seafood, sitting in ice. 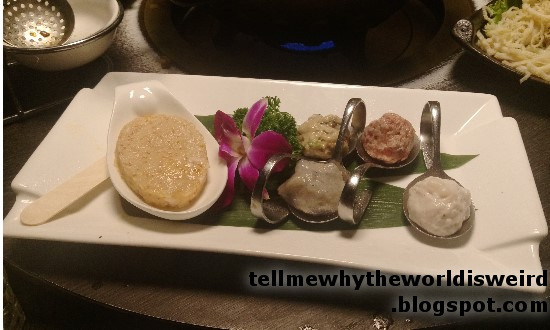 Meatballs made of different kinds of seafood. Notice the big tongue-depressor on the left- that's for dividing up the ground meat in the white saucer into smaller balls. Typically you get the waiter to do that for you. 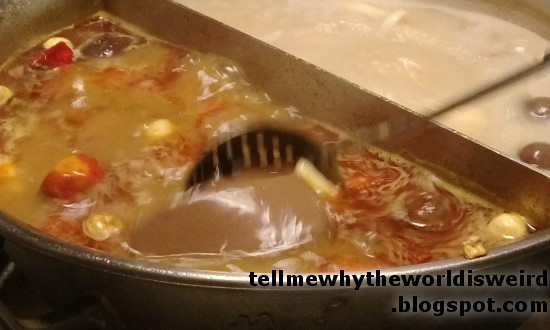 Using chopsticks to put the cow stomach into the pot. Using a big spoon to search for food that's boiled enough and ready to eat. Pulling rice noodles out of the pot. Scooping a block of duck blood out of the pot. It's kind of a similar consistency to jello. I don't eat duck blood but Hendrix does. Usually there's also tofu, which I totally love. And potato slices. 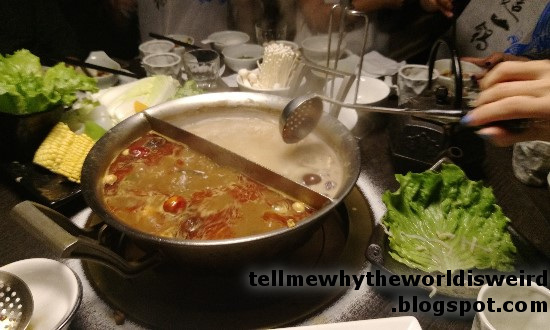 Hot pot is a really cool experience, though it does take longer than an average meal, and it's often hot in the restaurant because of all those boiling pots of soup. And then your clothes smell like hot pot. 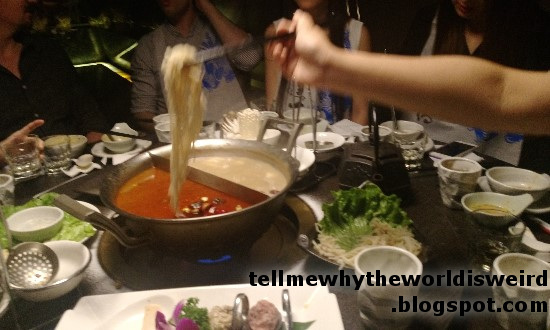 Definitely something you need to try if you're in China.